For better and sometimes for worse, Congress is a reflection of the aspirations, wants, and priorities of the American people. It reflects the kaleidoscope of special interests and unselfish service to others, of favors sought and sacrifices made. During each two-year session of Congress, thousands of pieces of legislation are proposed, many hundreds are given serious consideration, but far fewer are eventually enacted into law. Most enactments have limited impact, affect few, and are quietly forgotten in the flow of legislative activity. However, a small number of laws have risen to the level of historical consequence. 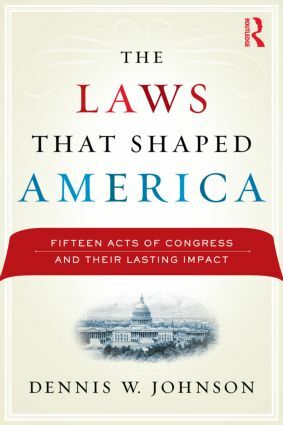 These are the laws that have shaped America, and they are the subject of this book. Which pieces of legislation were the most significant for the development of the nation? Which have had an immediate or lasting impact on our society? Which laws so affected us that we could not imagine how our lives would be without them? Dennis W. Johnson vividly portrays the story of fifteen major laws enacted over the course of two centuries of American democracy. For each law, he examines the forces and circumstances that led to its enactment--the power struggles between rival interests, the competition between lawmakers and the administration, the compromises and principled stands, and the impact of the legislation and its place in American history.